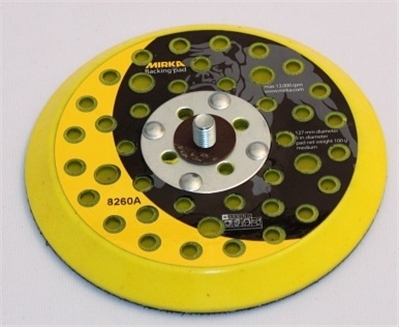 Convert your existing Random Orbital Sander for Superior Dust Collection with specialized Abranet Backup Pads by Mirka! Designed with special Abranet Hole Pattern to improve airflow and dust collection. Replaces OEM Hook & Loop backup pad on popular sanders. Will still work with conventional sanding discs. 5" diameter uses 5 Hole Hole Pattern. 6" diameter uses 6 Hole Hole Pattern. 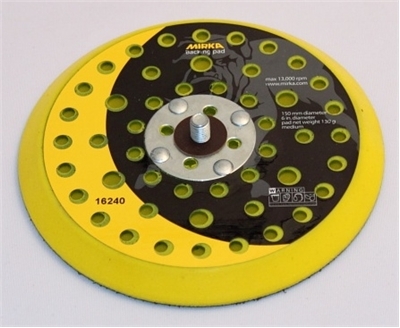 5" & 6" diameter Air Sander Conversion pads have 5/16 - 24 tpi x 3/8" long threaded center stud for Mirka, Dynabrade and other air sanders with standard spindle. Best dust collection efficiency is gained when sander is attached to shop vac or central dust collection system to increase airflow.